Ok, I think I made those hints in my last post way too easy! I’ll be sure to be a bit more vague next time. See, I’m already learning. 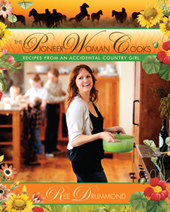 This cookbook, The Pioneer Woman Cooks, has rapidly become my family’s favorite. We have yet to try a recipe that we did not enjoy. My own personal copy of this cookbook is tattered and splattered. I’m not a neat cook. 😉 I hope the winner will love their copy just as much as I love mine. The nitty-gritty of how to enter is below. This giveaway ends on June 15th, 2011 at 11:59 pm EST. Random.org will be used to determine a winner who will then have 72 hours to respond to my email or another winner will be chosen. This giveaway is open to US residents only. The cookbook offered in this giveaway has been purchased by me. In no way have I been compensated for this giveaway. I love, love crash hot potatoes. I season them to match whatever else I’m making. I’ve used everything Tandoori spice to English Prime Rib Rub. Yum! Being gluten free, we eat a LOT of potatoes around here! I’m with Kat — crash hot potatoes are the best!!! I like Mommy Rambles on FB (and in real life). I follow Mommy Rambles on Twitter. I just retweeted about your giveaway (even if it reduces my chances of winning). I can’t figure out RSS, but you’re on my Google Friend Connect feed. Does that count? I retweeted this Giveaway on Twitter – I’m gonna give Cristi a run for her money! And I just subscribed via email! I’d love to try the tuna melts! The Milky Way cake sounds amazing! Very fattening but would make a special treat. Gonna head over to FB and share again! Baked fudge and apple brown Betty!!! Got my 2nd tweet in for the day….and Cristi is likely already in bed! Heh heh heh! Bumped the link on FB! Cristi is falling down on the job! I posted on FB, too. Creamy Chicken Spaghetti Casserole sounds wonderful, and sounds like something my family would quickly scarf down. Subbed by e-mail to your blog (using usbornebecky at gmail dot com), where I get all my blog feeds. I’m following you via Twitter (hope I picked the right one!). Got another tweet in about making Hot Crash Potatoes (Gorden Biersch garlic fries style) for dinner! I love her recipe for chicken fried steak with that absolutely perfect white gravy (although the gravy is more a light brown color) ….delicious! Shared on my FB wall using your button. 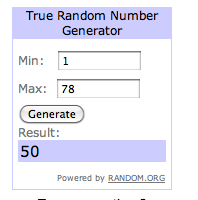 Extra entry cuz I guessed it! Go me! I follow you on twitter cuz well, I can! I liked mommy rambles on FB, yay for FB! I tweeted this sweet giveaway this AM, I tweeted it another time also. Retweeting while tokin on my hooka! I would love to try the blackberry cheesecake. I love pie and cobbler but haven’t had cheesecake. Tweet tweet…gotta keep up w/ Cristi! Gotta go post again on FB! And FB – it was easy using the buttons above! Bedtime tweet – Cristi’s slippin’ today! Retweet before I wind up off the grid for the wknd! Buttery rosemary rolls. nom nom!!! Getting in 1 last tweet! Awesome! I think it’s tell given the comment!